Dance classes are not only a way for children to express creativity and release their pent-up energy. They teach them life skills and progress their development in ways not many people expect. The skills learned in dance training are extremely beneficial to the maturation of your children.To get involved or to learn more, contact Broadway Arts Centre today. Kids’ dance classes develop their abilities to pay attention and focus on detail. In class, they will have to pay attention to their teacher to know what to do, and to remember what they are taught. When in dance class, young kids’ dance training is very basic. However in order to be successful in class, they have to pay attention to what their bodies are doing and where they are in space. Once they get older and the classes become more advanced, they learn choreography and how to pay attention to details in choreography. Dance classes for kids help to increase their memory. When children are very little, their ability to remember information is strengthened through remembering instructions from their teacher and remembering the very basic moves, like leaps and turns. As they grow older, they will begin learning more choreography and more technical moves, which will require them to remember more. This will increase their memory strength and ability to remember a lot of information. From a young age, dancers learn listening and watching skills. In a kid’s dance class, listening is especially important because there is a lot to listen to. Children have to learn to listen to the music, the teacher, one another, and the sound of their own steps. These are crucial skills that will help them in future years in school, relationships, and a future career. Part of learning how to listen properly is to couple that with following directions. Following directions is a skill that is learned and improves with practice. Dance class is a fantastic opportunity for your child to learn how to listen and follow directions. Kids also learn how to follow multiple sets of directions and be aware of the environment around them. 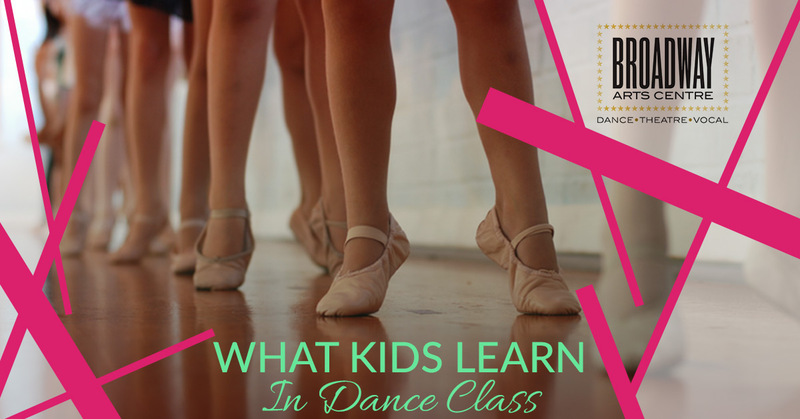 In a kid’s dance class, dancers learn to pay attention to the instructor and follow their direction, as well as follow the direction of the music, their classmates, and their bodies. Dance class is a great opportunity to learn about spacial awareness, and being cognizant of the environment around them. Many young kids are unaware about their relationship to the space around them. When they have to stand in one spot, or stand in line, it teaches them to be attentive to themselves and where they are in space. This will help them greatly later on in life, giving them the ability to show others respect through respect for their physical boundaries. At Broadway Arts Centre, we focus on creating technically strong students that have perseverance, and love their craft. We are dedicated to helping every student shine in their own unique way, and fall in love with the art of dance and performance. If you are ready to sign your child up for our high-quality dance classes, call us today.